Consult with our Decking Specialists to achieve the outdoor living space you’ve always wanted. Our deck designers can help you create a deck that is perfect for entertaining and relaxing. And, our experts can assist you in choosing the ideal product for your new deck. Deck Design Service: Bring us your measurements, a photo or blueprints of your home. We can provide a design based around your personal living style and design wishes. Remember to include measurements for patio doors, entry doors and windows that will be adjacent to your new deck and ground elevation. Special Order Service: There are more exciting options in decking materials and railings than ever before, which translate into greater design possibilities. If we do not stock what you need, it’s most likely that we can special order the decking you desire. Ask us about special railing colors, deck lighting and real stone tile for decking. 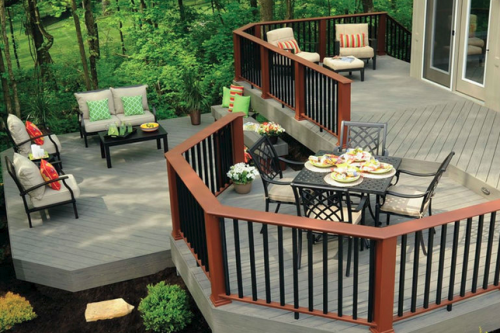 Quality Stock Decking Materials: We carry TimberTech, Real Cedar, Azek, EverGrain, YellaWood, Trex, Rhino Composite Decking, Western Forest Products, Fortress Iron, DecKorators, WestBury Railing, Aurora Deck Lighting, Dekor, Highpoint Deck Lighting, and ArborsDirect. Estimating: We can provide a materials list and estimate for your deck. Delivery Service: Lumber and decking materials delivery service is available in the Omaha and Council Bluffs area. Need to refinish an existing deck? Consult with our sales team for cleaning and refinishing recommendations.